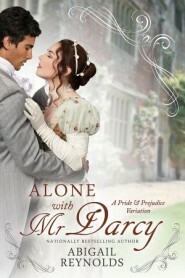 ← Alone with Mr. Darcy is here! My latest book, Alone with Mr. Darcy, just received a fantastic 5-star review from the notoriously picky Austenprose, so to celebrate I’m putting it on sale for 5 days – one for each star! Get it while it’s hot for Kindle, Nook, Kobo, iBooks, and other online retailers. Way back in 2011 when reviewing What Would Mr. Darcy Do? for my blog I wrote, “I would like to hereby bestow the title of ‘Queen of the Austen Retelling’ to Abigail Reynolds.” Although many years have passed since my proclamation, not much has changed. Every time I get to read a new work by Reynolds I’m always so excited to get a slice of her creative energy that makes her works so exciting. It also doesn’t hurt that her variations typically involve the always handsome and charming Mr. Darcy in some type of a Pride and Prejudice reimagining. With this being said, I quickly devoured this work and got these thoughts on paper immediately, such is the effect that Reynolds has on my reading habits! It’s been a while since Reynolds has come out with a new work, so I was building up my hopes as the time came for Alone With Mr. Darcy to finally hit the shelves. I am happy to report that Reynolds has met my high expectations and given me even more to be excited about. I consider her to be a cornerstone in the Jane Austen fan fiction community, and I’m so grateful that she is still writing such intriguing stories to share with us. Alone With Mr. Darcy is another great addition to this lineup, and it is full of fantastic and imaginative scenery and plot lines that are sure to make you read all of Reynolds’ works if you haven’t already. I hope you read it, enjoy it, and tell me what you think!